Did you know cigarette butts are the most frequently littered item? According to Keep America Beautiful, tobacco products comprise 38% of all U.S. roadway litter and they consistently rank as the top item found at SOLVE litter cleanups. Cigarette butts do not disappear. 95% of cigarette filters are comprised of cellulose acetate, a plastic which can persist in the environment. Littered cigarette butts are easily carried in storm water runoff through drainage systems and eventually into local streams, rivers, and the ocean. Harmful chemicals then leach into the water and the butts may be ingested by wildlife. It accumulates in corners, gutters, sidewalks, as well as on beaches and in natural areas. Litter in a business area, on roadways, or in a neighborhood, can create a sense that the community is not cared for, reducing property values and quality of life. Cigarette litter requires additional sidewalk and street sweeping, park maintenence, and storm water upkeep. Businesses, property owners, and government agencies bear the expense of cleaning up on and near their properties, passing on those costs to all of us. Improperly disposed of cigarrette butts can start both wildfires and structure fires, negatively impacing local wildlife and requiring major costs to put out, in addition to possible loss of life. Let's work together to solve this problem! 1. Volunteer at a SOLVE litter cleanup and collect cigarette waste for recycling. SOLVE hosts over 900 volunteer events each year throughout the state, find your favorite event using our opportunity search. 2. Lead your own cleanup! Volunteers can collect cigarette butts separately during cleanups and recycle with Terracycle, a company which turns the celluose acetate filter into new plastic products like pallets and plastic lumber. Click here for more information about leading your own cleanup. Call the SOLVE office to arrange for cigarette waste to be collected, or contact us to request a free shipping label from Terracycle. 3. Get a free pocket ash tray or car ash tray from SOLVE. Just e-mail quintin@solveoregon.org to arrange to pick one up from the SOLVE office. 4. Carry a portable or pocket ashtray when smoking outside. Encourage smokers to be aware of where their cigarette will be discarded. 5. Use a proper receptacle to dispose of cigarette butts. Don't litter your cigarette butts. Place them in an appropriate receptacle or use a pocket ashtray. 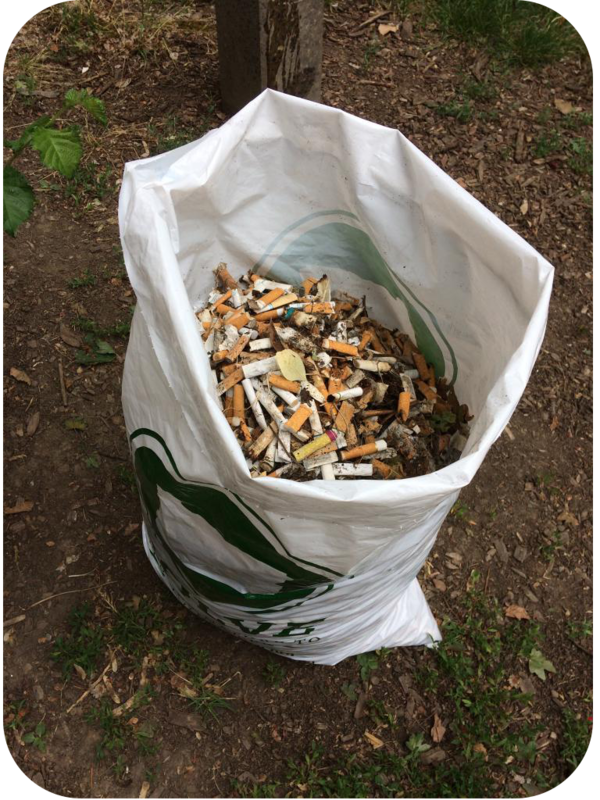 Whenever possible, SOLVE works to recycle the cigarette waste collected by our volunteers. SOLVE volunteers recycle over 100,000 cigarette butts each year!